The object is a fragment of an anthropoid inner coffin. It is rectangular and formed part of the left leg. It is painted on both sides. On the outside, three vignettes are painted, bordered by checkered bands and vertical textcolumns. Along the upper border runs a frieze of interchanging ma'at-feathers and uraei. The background colour is yellow. In the right vignette, a figure striding to the right is depicted. He wears a short kilt, a long wig and the ceremonial beard, and holds an ankh-sign and a long heqa-sceptre. Opposite, a winged udjat-eye is depicted, from which a uraeus with the Double Crown and ankh-sign hangs down. In between are food-offerings. The middle and left vignettes show the same scene, the uraeus is absent in the left one. Legenda are written in the vignettes. 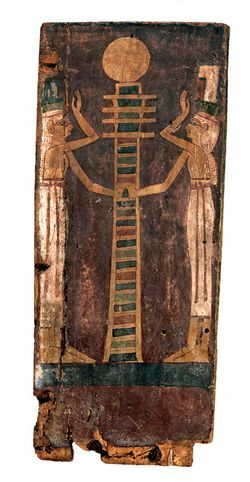 The representation on the inside is rotated 90 degrees in respect to the outside: Isis and Nephthys bewail a multicoloured Djed-pillar, crowned with a sun-disk. They both wear a white dress with two red ribbons, and have uncovered their breasts. Their hairs are put in a head cloth with a red fillet around it. On the head, the goddesses carry the hieroglyph for their names. The background colour of this scene is red. (2) that they may give offerings (consisting) of provisions, the best ointment, alabaster and clothing. (4) that she may give offerings (consisting) of provisions, the best ointment, alabaster and clothing. (5) I am Nephthys, the Morning Star, the eye of Re, [mistress of invocation] offerings. (6)-(8) Hapi, the great god, the great god.